Are you a business owner? Do you own a website? If no, then it is advisable to own one. In this technologically conscious world, it is mandatory that you own a website if you have a business. This would ensure a wider audience base and better growth prospects. However, owning a simple website is not enough. There is more to it. It must be optimized to the popular search engines so that the site is visible to the world. In other words, keyword optimization is nothing but advertising your site to the world in a way that the user would like to see it. This is done by effective keyword optimization. This ensures that your site is visible to the target group. Being visible means it has to be among the first three of search results. At least it should be placed in the first page wherein the chances of people noticing your site are higher. How do you do keyword optimization? For this delve slightly deeper and go back to the basics. One of the most important things to be borne in mind during keyword optimization is that the keywords must be easy and accessible. This ensures your content is picked up by the search engines and placing them on top of the search results page. For keyword optimization, there are a number of tools and software available for free as well as on paid basis. However, best to rely on the tried and tested ways in addition to the tools. One of the most potent tools is being a mind-reader and knowing what the user would be looking for. The tested, age-old method has six steps as below. Keyword research is never a 100% perfect prediction of what the user might use or think. It is simply based on the ‘gut-feel’. Optimizers make a long list of what they call ‘hunches’ wherein they compile a list of phrases or words. The words or phrases are the ones that the target group is likely to use for searching the products, services or content. The phrases are mostly representing the words that the establishment feels the users would look for. They are not a set of standardized words but mostly phrases pulled out of thin air. For example, if the establishment provides hair grafting services, then the optimizers would come up with phrases like hair loss, hair loss treatment, treatment for hair loss, etc. These are the phrases the company hopes people would use to look for the services they provide. While brainstorming, it is necessary to let the brains run like wild horses. Do not set any limitations to the list. Think like a consumer and focus on what would be asked for rather than how to bring your business into the picture. Also, think of what is best for your content. Whether using modifiers like Ontario, Los Angeles, CA or free, etc. would work. These points are absolutely necessary at the time of optimization. In this second step, you actually analyze the list of phrases developed during the brainstorming process. In the analysis, you determine if the keywords developed from the list of brainstorm are the right mix of demand, relevance, and attainability. Do the keywords have the relevance to earn top SERP results? If the answer is an unhesitating ‘Yes’ then simply go ahead as you are on the right path. If ‘No’ then eliminate those that are irrelevant. You need not use a keyword research tool if you are an apt mind reader. For the beginning, you may need some research tools at a basic level like WordTracker, Google AdWords Keyword Planner, etc. The former is a paid tool while the latter is the more basic, free tool. There are advanced tools that even offer in-depth competitive analysis and search engine insights for Google, Yahoo! and Bing. The best way to shortlist your keywords is to manually enter the phrases from your brainstorm list one by one or all together. 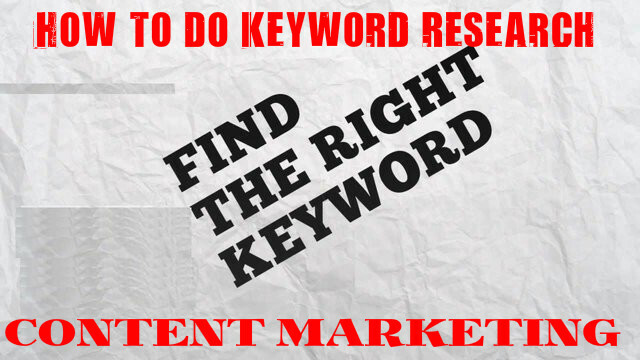 Entering in small batches of 10-12 keywords would be ideal. This makes parsing through related phrases easier. Keyword research tools commonly return with suggested phrases similar to the original phrase. For example, Google Keyword Planner offers suggestions to the keywords used. These are called ‘keyword ideas’. The priority of the Planner is to support the ads. Therefore, the results are returned in two different tabs- ad group ideas and keyword ideas. Keyword ideas are organized by the average number of searches conducted on a monthly basis. The full list can be seen by clicking on the keyword ideas tab. However, the first ones to load would be ad group ideas. The suggested keywords help you understand the target group and the likely terms they would use for searching your list of products or services provided. The information comes in handy since you can build and refine the target keyword list, content roadmap, and product strategy. Keyword and Content – How they Link? Generally, while optimizing, it is very easy to get carried away and choose even the ones that hold no relevance. Always remember that the keywords chosen must describe the product and content. It should not be a loose idea of the content or a general need of the target group. What am I, as a user, looking for through this query? What do I expect to be displayed on the site? Will my needs be satisfied by the site? The answers to the above questions would give you the method of approach. However, the answers must not be from you the business owner, but they must be from you, the user. It is important to think like a user rather than the business owner. It must be kept in mind that the users are humans and Google spiders are clever. Fooling them can spell doom! Average monthly searches of keyword phrases would give you an idea how many times a particular phrase is used for searching. A keyword with high search volume means that there is a high consumer demand for the particular information or product. It also tells you the exact language users are using to get more information on the particular product or service. Tools like Google Keyword Planner displays results exclusive to Google search engine. On the other hand, SEO Tool Set which is a paid keyword research tool would display the statistics for Google, Bing and Yahoo!. Based on the statistics, you can update your keywords list so as to stay at the top of the race. This identification of search terms yielding higher volumes indirectly means identifying the demands and trends of the consumers. If you optimize your site with the exact phrases and terms used by the searcher and Google, your content would naturally get recognized as completely relevant and you would qualify for the top three contenders. Looking at the average monthly searches in the keyword planner would help you with a lot of other things apart from being the top three contenders. The searches give you a number which is the perfect search volume for your business. However, this number would vary from time to time, object to object and even brand to brand. Long clichéd phrases like ‘how to camp outdoors in Arizona’ would have a far lesser search volume. Broader keywords like ‘camping in Arizona’ would target the exact audience. Conversions are more probable with these terms. It is wiser to drive ten leads that actually spend time on your site and buy products rather than driving a hundred users who leave the site as soon as they enter without clicking on any other content. Sometimes, it is advisable to use long tail phrases that are very specific and have a high search volume. However, this must be done only after adequate research from the keyword ideas section. Every business has a competition and competitive analysis is all about analyzing your competitors- what they are doing and how their SERP space look like. To get a peek at your competitor’s space, search for the phrase you are planning to set rank for. Enter the phrase on the Google search engine as if you were the user himself or herself. Do the search results offer products or services similar to yours? Are the top ten results those of highly competitive brands? Are the top ten results anywhere related to your content? The answers to the above questions are a definite yes then you are on the right track. The next step is to look at the top ten, especially, the top three competitors. Look at their current trends, the language used and keyword phrases. You can get the key to beating them. One way is to get an edge by doing more right. Therefore, it is necessary to analyze their rights and wrongs. Pay special attention to what they are doing wrong. Their wrong could be your correct and your drive-in point. An in-depth, detailed view of the phrase can be obtained by doing a Google search using the term “Allintitle: target Keyword”. The target keyword is the phrase you are targeting at. Doing this, you can get an idea of how many web pages of your competitor actually contain the exact phrase in the Title tag and also how many other pages are actually optimizing for the phrase. Sometimes, you would see only the top brands being displayed in the top ten results. This means the keyword competition is too tough. For example, brands like Microsoft always bag spot one and beating them is almost impossible. What would you do in such a case? Obviously, target a different phrase that has a chance of higher ranking. In other words, do things differently. In this way, you can drive in more traffic and are likely to see more conversions. Isn’t it better to be ranking number one with a thousand monthly searches than ranking 20 with a phrase having ten thousand searches? The above is if the results were seen are similar to your core business. However, what would you do if the results are not similar to your products and services? This happens when the same phrase can point to two different things. For example, if you are optimizing a page that teaches people to create custom ringtones, then your keyword phrase would be ‘how to create custom ringtones’. This is a long-tail keyword phrase. Theoretically, this is relevant to your content. You may expect to see tutorials on editing the software and making custom ring tones. However, what can be seen maybe something different? Something like how to make a bass drum! This is something disappointing and sometimes frustrating. You search for something but get something else which is nowhere near to being useful. This simply means a lot of optimization effort gone waste and no traffic either. Users only click the first three (rarely five) of the search results when searching for something. Hence, ranking in the first three is necessary. For this, every page must be rich in a keyword. In addition to the body content, the keyword must be adequately present in the meta- titles and descriptions. Simple optimization often results in a foolish, wasted effort. Doing it the right way, using the right language would yield higher and more dependable results.